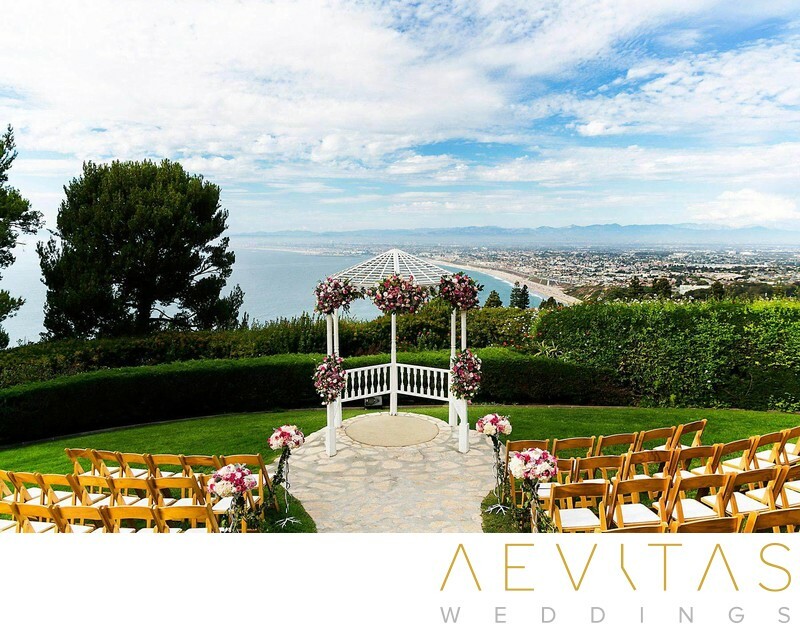 With sweeping views across the Palos Verdes Peninsula and distinct Spanish-style architecture, La Venta Inn is set within a stunning private estate to the southwest of Los Angeles. Built in the 1920s as a luxurious private residence, it evokes warmth and charm in its elegant architectural features that include red-roofed tiling and a distinctive tower. A gorgeous white gazebo within its expansive semicircle of lawn is the perfect location to say “I do”. Surrounded by beautifully landscaped flower beds and lush palm trees, it is backed by a dramatic panorama of the Pacific Ocean. After the ceremony, your guests can mingle in La Venta Inn’s intimate courtyard, enclosed by an arbor of bougainvillea and with a bubbling fountain as its centerpiece, or wander through the vintage-style interior of its magnificent residence. Its rooms feature wooden floorboards and cream interiors that create a sense of space and light, while magnificent open-beam ceilings and wrought-iron chandeliers give its main ballroom a stately elegance. Dine and dance the night away with your guests within this elegant setting, then step through the French doors onto La Venta Inn’s stone patio that boasts commanding views across Santa Monica Bay and can be equipped with patio heaters if the weather requires. La Venta Inn works in collaboration with the New York Food Company Culinary and Event Production team to create exclusive and unique wedding events. This company is renowned for its level of service and artistry, down to the tiniest of details. Wedding couples have exclusive use of the property throughout their special day, including dressing rooms for the bridal party and complimentary attended parking for your guests. La Venta Inn has the capacity to host up to 250 guests and their on site event coordinator is on hand to assist couples in creating the most memorable wedding day possible.